Being able to travel safely and comfortably with a laptop in your backpack is crucial for securing your most valuable possessions. Laptop backpacks are a useful accessory for enabling us to go from place to place while keeping our hands free and ensuring our gadgets are kept properly. With the increasing use of laptops over desktop computers these days, there are more choices than ever when it comes to laptop backpacks, but choosing the right one that’s worth your investment can be challenging. If you’re in the market for a laptop backpack, or you’re in need of an upgrade, we’ve done the hard work of sorting through the reviews. We’ve created this comprehensive laptop backpack guide to save you time and money, while presenting you with the best options in the market today – as well as some useful information on laptop backpacks that will come in handy. We’ve searched the laptop backpack market high and low to find one that will suit your needs. These backpacks were chosen for their ability to safely protect your computer, which is for many people, one of the biggest investments they make. Other major factors that we’ve taken into consideration include comfort, durability, and price. Last but not least, style; because having a functional laptop backpack does not mean that you have to sacrifice looking professional. We understand that you take your laptop backpacks to meetings too, so we’ve got you covered. Your laptop is important, but even more important is the bag that protects and cares for it as you go about your daily life. This is why it’s necessary to invest in a bag that won’t cut corners when it comes to quality. No one knows their bags better than the customer, so in order to come up with the best in the market, we’ve read the reviews so that you don’t have to. If you’re serious about the form and functionality of your laptop backpack, you can’t go wrong with the Mancro Laptop Backpack. It does the job of holding your backpack securely and it’s ideal for everyday use for work or college, but that’s not all. This unique bag has anti-theft features and is water-resistant; plus, it’s also durable enough to hold much more than just your laptop. Count on this bag to carry books and notebooks, and it’s also equipped with a nifty USB charging port that lets you charge on the go. This bag can carry laptops under 17 inches, and has a generous capacity of 40L. This bag is also loved by customers who value staying organized: it comes with over 10 compartments, plus separate sleeves for a laptop, smart phone, tablet, passport, wallet, keys, pen, power bank, folders, and binders. On top of that, it can also fit a change of clothes, an umbrella, and a water. Security is never compromised thanks to the combination lock; thieves won’t even have a chance when you use this backpack. There are thousands of reviews from customers who aren’t just satisfied with the Mancro Laptop Backpack; they’re thrilled with how this bag under-promises and over-delivers, especially when you check out its price tag. Many users expressed their satisfaction when taking this bag to the beach and the outdoors, and even exposed it to water yet everything inside was kept dry. That’s because this bag is made from high-quality water-resistant polyester fabric, it has a reinforced bottom and durable metal accessories. So no matter which direction water gets splashed onto your backpack, you can have peace of mind that your belongings are nice and dry. This is a thoughtful feature for a laptop backpack, considering that most models in the market are made for city use. And that’s one of the reasons why this model stands out. Additionally, many reviews point out how this model makes a suitable laptop backpack for people who travel a lot. According to a few reviews, many found that this backpack isn’t as durable and that it’s prone to wear and tear. Some customers who travelled with this backpack for several weeks discovered that it couldn’t withstand the elements enough. So while this backpack is roomy and can hold as much as 40L, as long as you don’t treat it like a hiking backpack and ensure that it’s well taken cared of, then it will last you a long time. Overall, the Mancro Laptop Backpack is an excellent choice whether you need to go from boardroom to meeting room, or from home to the outdoors. Its thoughtful and ergonomic features, not to mention affordable price, makes this a top choice for students and professionals who need a reliable laptop backpack without breaking the bank. 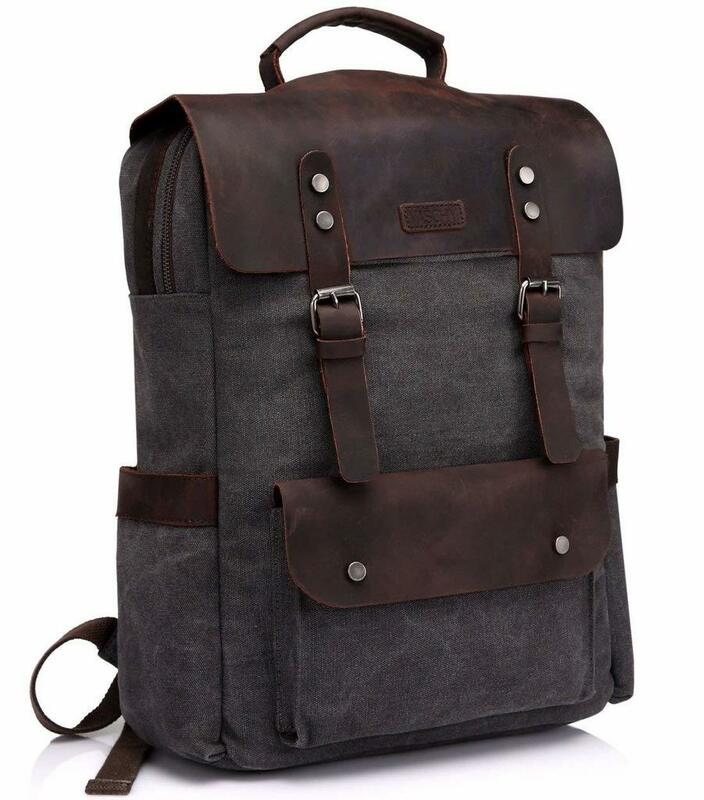 If you’re ready to upgrade your bag to a stylish laptop backpack with good price points, the Vaschy Leather Laptop Backpack is highly recommended. Equipped with numerous impressive features and a spacious 20L capacity, this backpack is one of the best-made laptop backpacks that are less expensive than average. 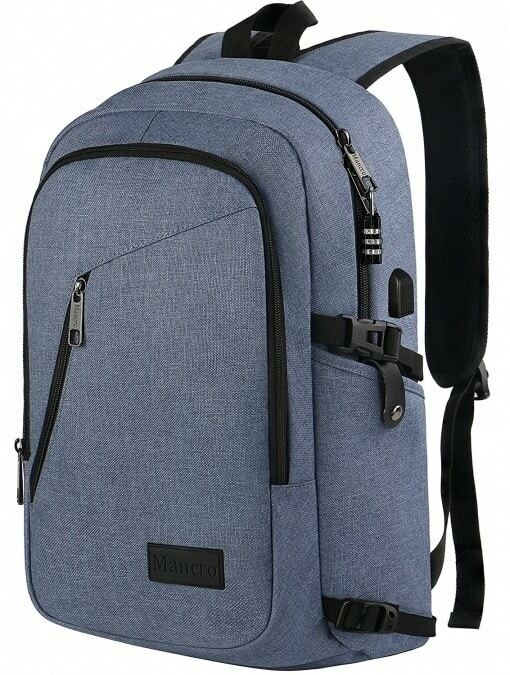 This laptop backpack is manufactured by Vaschy, a brand renowned for producing high-quality active and casual wear. It has just the right room to take your daily necessities to and from work or school without causing strain on your back or shoulders. Many commuters and business users find the leather trimmings a nice touch, because it lends to the professional look of the bag. Vaschy has used leather in the zipper pullers, which are sturdy and solid, allowing you to have a firm grip each time you slide the bag open. Leather is also found in the hanging hook, and flaps located on the front. The ergonomic shoulder straps are dual-padded and reinforced for added comfort. The back panels are completely padded too, so even if you use up its 20L carrying capacity, it will still be a delight to travel with. Inside, the bag has a padded sleeve for storing a 15-inch laptop. Its two small interior pockets which are perfect for keeping things such as calculators, passport, or keys. Two side pockets will keep your water bottles on the go. Keep your things organized inside the large main pocket plus two pockets on the front and a zipped pocket located behind the bag. The Vaschy Leather Laptop Backpack has ample space for carrying thin books and notebooks as well other basics. Everything is stored in an elegant leather and canvas bag made from 100% cotton canvas for durability and breathability. This excellent material is also shrink-resistant, so each time your bag needs a little cleaning up, there’s no worry of shrinkage. Based on the reviews, many customers aren’t confident in the durability of this laptop backpack. It seems as though despite its carrying capacity of 20L, it isn’t advisable to fill this backpack up too much, especially when using heavy items. The reviews also say that the flaps and zipper don’t withstand long use, and that this isn’t a bag the users feel comfortable about taking outdoors. Should those be the needs you’re looking for in a laptop bag, you may be better off with one that is made to withstand the elements, since this model may be better off suited for users who don’t expose it to the elements. However, it’s good news that the manufacturer offers warranty for a year when you order this bag. The Vaschy Leather Laptop Backpack is still one of the more affordable and good-looking styles in the market. Provided you use it with care, this will be one of the best purchases you can make. If you’re looking for a tough laptop backpack that is highly functional, the Sosoon Laptop Backpack is highly recommended. The bag is constructed using high-quality tear-resistant, anti-scratch, and water-repellent double-pile polyester, so you can be sure that all this protection will help this bag last you a long time. This is highly recommended for people who use gadgets frequently because it has an external USB port that lets you charge phones, tablets, and devices without having to open up the bag. This handy feature feels like a bonus, considering that it’s priced on the lower end of the scale. Inside, the padded sleeve can fit laptops up to 15.6 inches, plus it also comes with other useful pockets that you may need for keeping your gear in place such as cables, chargers, and headphones. That’s not all: this affordable pack is also equipped with anti-theft features such as invisible pockets behind the bag, and a hidden zipper. Considering all these features, you might think that the bag may be sacrificing comfort. The truth is that the innovative designers at Sosoon have integrated an feature that allows the bag to balance out, so that even if you’ve packed the bag to its full capacity, it actually feels 25% lighter. If you’re one of those people who have to endure a long commute to and from work, this is excellent news because you can say goodbye to those days of coming home with an aching back just from carrying your things with you. The Sosoon Laptop Backpack’s shoulder and side straps have breathable mesh padding to give you extra support through cushioning. Furthermore, this model is perfect for traveling, thanks to its upright handle, and its size complies with most airline requirements for carry-on bags. If that sounds too good to be true, it’s definitely not, as seen in the customer reviews. Users are very happy with how comfortable the bag is. They’ve reported that it isn’t painful unlike many other backpacks in the market, especially when filled to its maximum capacity. Many have written about its satisfactory build and the comfort provided by its cushions, and say that this bag can be comfortably worn for long periods of time. Not many bags in the market can brag about the same thing. Some reviews have added that the Sosoon Laptop Backpack is sturdy enough to be taken on long international trips, which is testament to just how tough it is and its ability to withstand the elements without getting beaten up very quickly. Just make sure to test the USB port as soon as you receive it. Whether you need a reliable business or travel laptop backpack, the Sosoon Laptop Backpack ticks all the boxes. Another excellent contender is the Case Logic Laptop Backpack. This voluminous dobby nylon pack can hold up to 17-inch laptops in its dedicated compartment. But one of the features that truly make it stand out is its speed pocket; a secure yet quick-access storage for your necessities such as mobile phone, watch, and keys. This feature comes in handy for travelers, especially when passing through airport security or getting in and out of other transport options. 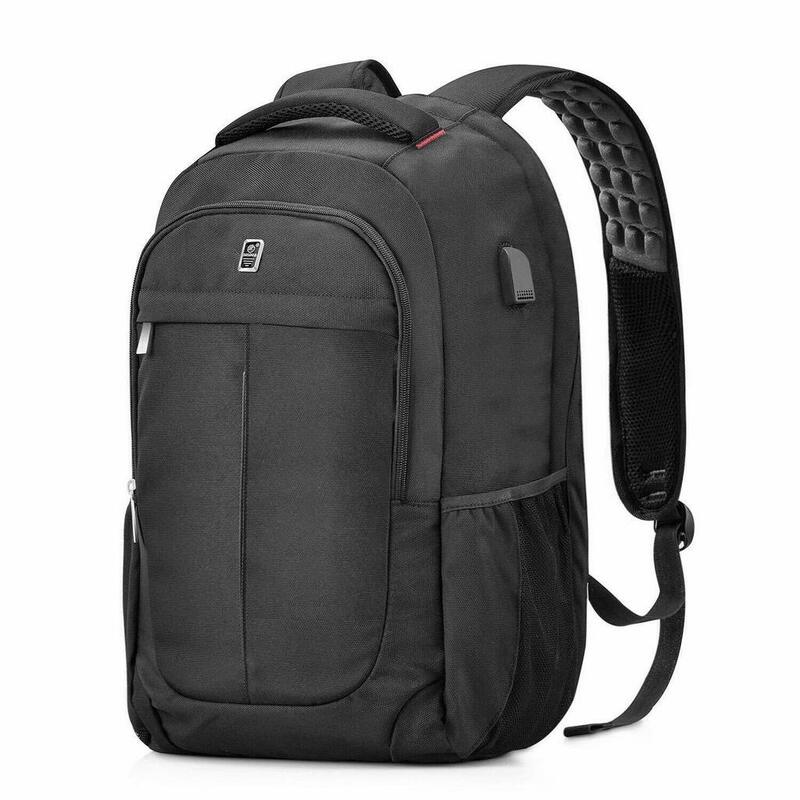 Compared to other bags that are rich in features, the Case Logic Laptop Backpack has more of a minimalist style. If you’re a frequent traveler, looking for a bag that is smart and simple but reliable and safe, this is the bag for you. The external mesh pockets allow you to store small items such as snacks and water bottles, while the adjustable shoulder straps and grab handle makes getting around hassle-free. The main compartment is spacious enough to hold a few extra things but it stands out for its practical and smart features. 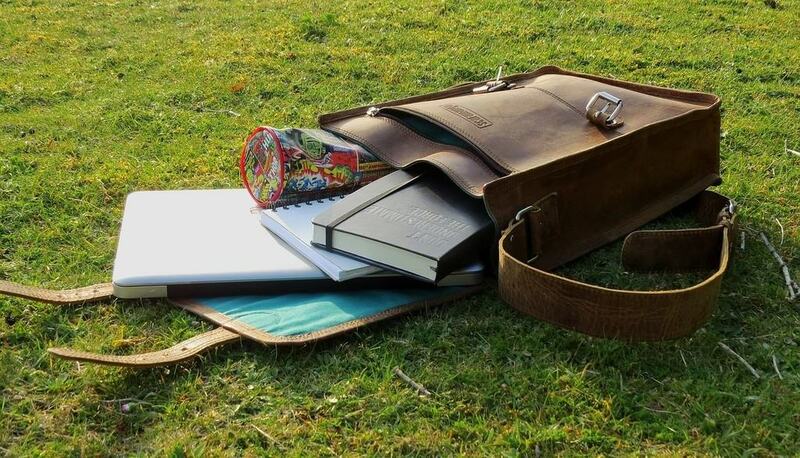 The 25L capacity of this bag makes it ideal for students and businesspeople on the go. It will securely carry your laptop plus a few basics. It’s also made by Case Logic, a brand that is well-known for making premium, high-quality laptop and camera bags. The price points of this bag are excellent too, so much so that you don’t really have to think twice about purchasing it because it’s so affordable. 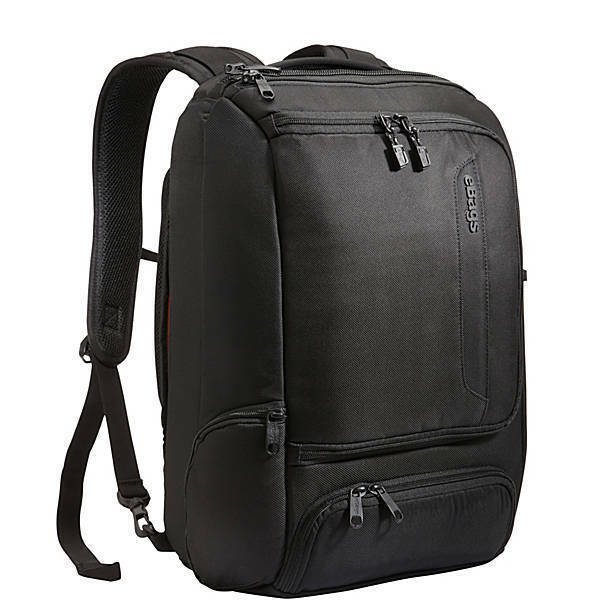 According to the reviews, this backpack is decent and it will last a long time provided that you use it for its primary purpose: as a laptop bag. It does exactly what it promises, and nothing more. 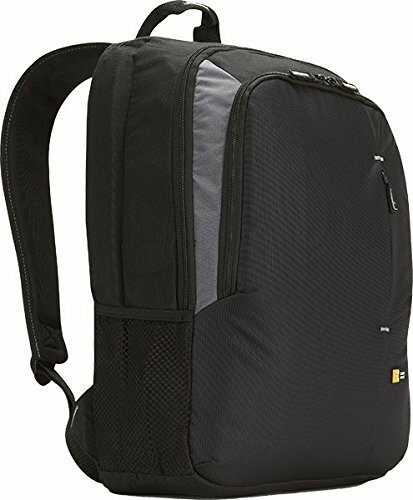 For many people looking for a basic laptop backpack that is practical and minimal, then look no further than the Case Logic Laptop Backpack. However, some users have noted that it tends to break easily if you use it to its full capacity all the time. Some people have noted that this backpack doesn’t do well when exposed to rain and moisture, so if you go with this bag, you’ll have to take great care in making sure that it doesn’t get wet. If you require a backpack that can carry many other things such as books, food, and other essentials, you may want to consider another bag. Overall, the Case Logic Laptop Backpack is a well-constructed bag designed for a straightforward purpose. If you use it for what it was intended for, this small investment will go a long way. When you need a compact bag that’s spacious and durable, the eBags Professional Slim Laptop Backpack comes highly recommended. This bag is a beauty to look at, but it doesn’t cut corners when it comes to functionality. Few bags can withstand pressure as much as this one; it has a crush-proof AC adaptor garage, plus fully padded laptop and tablet compartments. It can fit a laptop with 16.5 inches in display, but if you remove the tablet compartment, you can have all the space you need for a 17.5-inch laptop. This bag is versatile too! You can easily convert it from backpack to briefcase and use it as both a horizontal and vertical luggage. Either way you choose to use the eBags Professional Slim Laptop Backpack, it’s a joy to use because of its comfortable handles that won’t wear neither your hands nor your shoulders down. It’s equipped with a thoroughly passed Airmesh back panel, which is vented as well for added comfort, plus removable and adjustable shock-load sternum straps. The eBags Professional Slim Laptop Backpack is extra thoughtful when it comes to eliminating clutter zones. In fact, if you use this bag, you can’t help but be organized! Accessing your valuables is super easy thanks to the isolated rapid-access compartments, so you no longer have to dig through your bags to get your laptop or tablet. Access is guaranteed within seconds because of its innovative design. Additionally, the high visibility nylon lining ensures that you don’t have to spend more time than needed to get to even your tiniest items such as passport and keys. The bag is also designed in such a way that you can easily secure all the zippers, preventing theft while taking this bag with you through thick and thin. The reviews for this bag are pretty solid. Users rave about its excellent workmanship and the many thoughtful features that it has. There are also reviews detailing how impressed customers are because this bag never mentions that it is waterproof or even water resistant, yet it held up surprisingly well when they were caught in an accidental downpour. Customers also appreciate the sleek design, which adds to its professional look and can be taken to workplaces without sacrificing form. People who have purchased this bag have also realized that considering the price, it’s a worthy investment especially if the laptops and electronics you intend to store in it are expensive – simply because it does the job. On the other hand, some of the reviews express disappointment because its zippers tend to break easily. There were also comments about the bottom being too rigid, which can cause difficulties when you stuff things in. While this bag is durable and spacious, if you make this purchase, you may want to take caution in placing your valuables in it and using the zippers especially if you’re in a hurry. As a whole, the eBags Professional Slim Laptop Backpack is a great choice for business people who are frequently on the go. It will keep your things organized and secure for a long time. More people these days are giving up the office job that ties them to the desk. The gig economy is expanding quicker than ever, and more people are working remotely or off their laptops in places other than the office. But whether you work in the office or not, laptops are by no means cheap and this is why it’s crucial to take good care of your investment and the data that it contains. This is especially important if you’re a professional on the go. Sure, a regular backpack can store your laptop. But that doesn’t mean that it will protect your laptop in a way that a dedicated laptop backpack will. Laptop backpacks are designed with padding, which average backpacks don’t have. This padding is critical to protecting your computer from physical damage which will cost you money to repair, if it can even be repaired. The point is, you wouldn’t want to take the risk of damaging your laptop because it wasn’t given the protection it needs. Additionally, standard backpacks don’t have the same kind of compartments and organizational features that a laptop bag has. Individuals who need a laptop backpack don’t only need it for that purpose: they also need space for things such as other gadgets. Perhaps a busy salesman needs a tablet plus a slot for other documents and notebooks, which your standard backpack doesn’t have. On the other hand, laptop backpacks have these thoughtful features, because they are constructed with busy people in mind who value staying organized. Another primary reason why people should invest in laptop backpacks is for comfort and health. You probably don’t realize it, but your shoulders and back take a serious beating every time you use a heavy backpack with flimsy, uncomfortable shoulder straps; not to mention the extra weight added by your laptop content. In fact, using the inappropriate backpack for heavy things such as your laptop for a very long time can cause serious injuries in the future. This is one major health hazard that you can prevent by investing in the right laptop backpack. But it doesn’t always have to be a major investment. There is a misconception that laptop backpacks are always expensive because of all the added features. The truth is that there are so many choices in the market that are so affordable, you won’t even have to think too hard about making that purchase. There are so many terrific brands out there that create world-class laptop backpacks, which will last you for years to come as long as you take good care of them. So even if you’re on a budget, finding the right style is easy. Durability - Laptops are expensive electronic devices, and taking them to and from places has become a necessity. If you own a laptop, you might as well invest in a bag that is made to take care as you travel or commute. Durability in build and construction is critical in preventing your laptop from getting jostled around, especially if you’re on the go a lot. Look for padded sleeves, cushioned chambers, and well-sealed seams. Water-resistant fabric, or at least a rain cover, would also give you an added line of defense against the elements especially if you’ll be using it in the outdoors often, or if you’re a business traveler. Security - Considering how expensive your laptop is, not to mention all the confidential data it stores, it’s important to choose a laptop backpack that has security features. When you’re tired from traveling, the last thing you need to worry about is a pick-pocket. And these days, thieves are getting smarter by the minute. Anti-theft features such as lockable zippers, cut-proof material, RFID technology will go a long way in protecting your sensitive and valuable items, giving you the most important benefit of all: peace of mind. Thoughtful compartments - Not all laptop backpack users may find this necessary, but for many, having a good number of thoughtful compartments helps with organization. This feature is especially important for individuals who carry a lot of small pieces of equipment or things with them in their laptop backpack, such as cables, headphones, calculators, tablets, mobile phones, keys, passports, and more. On the other hand, there are also some individuals who prefer minimalist travel backpacks that have less compartments. Choosing a style with the right number and kind of compartments that you need helps you stay organized in exactly the way that you want. Size - The most common laptop has a 15-inch screen display. But with new technology coming out faster than you can say computer, we’re now seeing laptops that cater to more specific needs. This is why there are smaller notebooks, as well as laptops with massive 17-inch screens. It’s important to take into consideration the size of your laptop, as well as the other things you’d like to keep in it, when choosing the size of your laptop backpack. If the laptop sleeve is too large, your computer will end up moving around the bag during travel, and the impact from this can lead to permanent damage. Ergonomics - When you’re on the go a lot, you’ll need a laptop backpack that doesn’t weigh you down and cause burden to your shoulders. A model with ergonomic features such as fully-padded straps and weighted construction adds to the comfort, especially if you’re carrying a heavy load. Other features you may want to look out for include load-lifting straps, a contoured shape, or a stabilizer. Style - Laptop backpacks come in an extensive range of styles to suit different needs. There are casual bags for students, as well as more elegant styles for professionals. Before you settle on a design, consider if its style reflects your personal style, which doesn’t have to be sacrificed for function. Many laptop backpacks these days are actually designed to be fashionable, because no one wants to purchase a useful bag which lacks greatly in aesthetics. Extra features - While laptop bags are primarily designed to store your laptops, many styles on the market come with extra features that do come in handy. These include exterior mesh pockets for water bottles, USB chargers, or reflective straps. No matter what you use your laptop for, investing in one means that you have to commit to taking care of it too. Even if you handle your laptop gently, the inappropriate laptop bag can result to damage all too quickly. Selecting the right laptop backpack involves a lot of time and consideration, because there are a lot of things you should think about. Where do you plan to take your laptop? How far is the distance you have to commute on a daily basis? What else do you intend to carry in your bag? Once you’ve decided, you then have to factor in the comfort and security aspects of the bag. These preferences are all very personal, yet far too many people place little importance in these things. You don’t want to have to wait until you accidentally break your laptop because you used a laptop without sufficient padding, or until you’ve lost your belongings because a thief outsmarted you. Laptop backpacks are the next most important investment you can make after buying a laptop. When you have one that meets all your needs, there’s no need to worry about mishaps or losing your belongings. Don’t make the mistake of waiting until the last minute. Remember, your laptop backpack is likely one you will use throughout the week or take in your travels. When you have a laptop backpack that you’re happy with, you have one less thing to worry about and more time to focus on what’s important.